I recently visited Oscar’s Steakhouse at the Plaza in Downtown Vegas for the first time in a couple of years. I enjoyed Happy Hour on that first visit (see full review at Vegas Chatter) and enjoyed the experience. Unfortunately the Happy Hour deal at the bar is no longer offered and the beer selection is back to mainstream basics. That was okay for this visit as I was having a meeting in the lounge that would end in dinner in the dining room. You know that iconic dining room at the Plaza that juts out above the main hotel entrance (where valet should be) as you can see in the photo above. Since that first visit to Oscar’s I’ve been telling people who it’s one of two steakhouses to visit in Downtown Vegas. The other is Andiamo’s Steakhouse at The D. While the steak was great my thoughts remain almost the same. The New York Strip is normally my steak of choice but I decided to switch things up with Joey C’s Filet Mignon (12 ounce $44) prepared medium. Besides a little cartilage you see in this bite the steak was perfect. The exterior was charred and topped with a little kosher salt (which makes everything better) and black pepper. The center was as pink, tender and beautiful as you could want. The steak was cooked to perfection and it was delicious. The filet was probably better than the NY strip. That’s a rare opinion for me. This visit to Oscar’s Steakhouse was better than the first time in part because I had a better steak but also because we sat in the dining room instead of the bar. If you’re looking for a great steakhouse experience in Downtown Vegas you really have two options – Oscar’s Steakhouse at the Plaza and Andiomo’s at The D.
Both steakhouses have excellent steak. Both steakhouses are similarly priced and less expensive than the Vegas Strip. Both steakhouses have a unique vibe that can’t replicated anywhere else. I would gladly eat at either steakhouse and I’m glad I was talked into meeting at Oscar’s to reaffirm that thought. 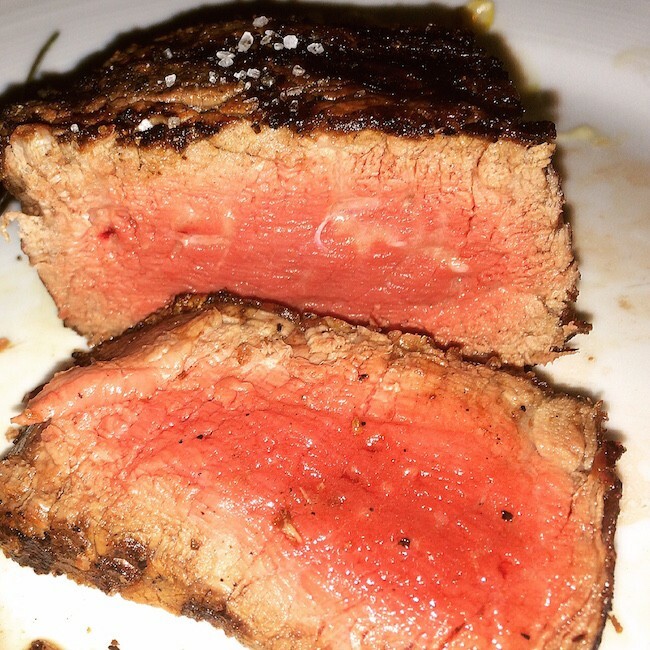 Update: Check out the Best Steakhouses in Downtown Las Vegas at Top 10 Vegas.